Volunteering with a youth wheelchair sports camp at Dalhousie in 2017, Madison Campbell gained a deeper understanding of the difficulties facing powerchair users interested in sports in Nova Scotia. The fourth-year Kinesiology student recalls feeling shocked upon learning of the lack of parasport options for individuals in the province in powerchairs, the motorized version of a manual wheelchair. She explains that the only powerchair sports leagues on offer are bocce ball and sailing, neither of which are team based. 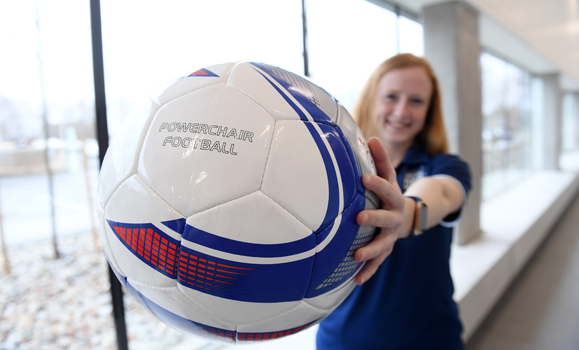 That’s about to change thanks to Madison, who has spent the past two years developing the province’s first powerchair soccer league alongside mentor Paul Tingley, a Paralympian and parasport coordinator for Nova Scotia. “Powerchair athletes don’t have the same opportunities that I had growing up [as a non-disabled person] to be involved in the sports that I love,” says Madison, a lifelong soccer player and member of United DFC, the local grassroots soccer club for the Dartmouth region. Madison says the lack of team parasports for powerchair users is problematic given that many people join sports specifically to participate in a team environment. “A lot of my courses have been focusing on community development as well as just being aware of what it takes to be inclusive and providing people … opportunities for recreation,” she says. 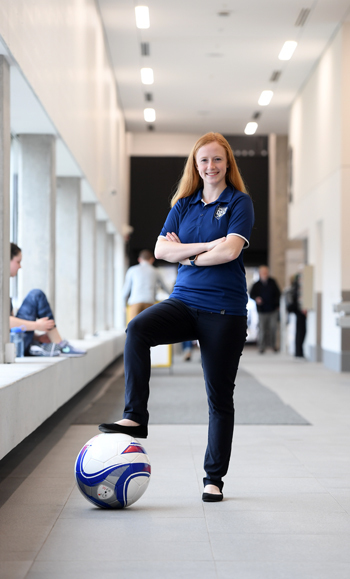 And although she has been coaching for years, Madison took a coaching course that highlighted what it takes to create a curriculum — particularly valuable given that there isn’t any standardized curriculum for the powerchair soccer community in Canada like there is for soccer more generally. “We really had to take what little information we had and create a brand-new curriculum for these athletes,” she says. Earlier this month the league held a successful ‘come try’ event. The years of hard work and organizing to collect funding for equipment and to find a location to hold the league, along with many other complex organizing efforts, will soon be actualized when the league launches April 3 at the Zatzman Sportsplex in Dartmouth. The league will feature two 10-week programs for junior and adult powersport athletes.